Babies are cute and innocent. This is the joy of a child: They see the world in a pure manner. However, this also means that the parent or caregiver has to really take charge of the child to ensure that his or her basic needs are under control. After all, a young baby can not feed or even use the bathroom by him or herself. This is why you should consider investing baby changing mats so that no matter where you are that you can still change your child. Your child will soil him or herself when he has to go. This is a fact of life. Thus, you can not expect that the baby will only use the bathroom when at home. 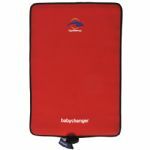 Baby changing mats are great because they allow you to always change your child no matter where you are located. This is especially convenient if you are on a holiday or are at the beach. You do not want to change your child just anywhere because it could be uncomfortable for the baby and hard to clean up. Always look for baby changing mats that are easy to clean. Most are made so that you can simply wipe them up and then fold them back up. This makes using and transporting them incredibly easy. Lastly, be sure to invest in fun colored or patterned baby changing mats. If you have a baby, then you will probably use this item quite often. This means that you will have to pull it out and use it more than once a day. Thus, take the time to invest in brightly colored items that are as much fun for you as they are for the baby.